I was going to call this one done, but now I have a problem to solve. I tried to finish this one on the road at Reaper Con but I didn't manage to pull that off. I just didn't have the time I needed although I did have the right tools. Last night I was able to sit down with the powders and finished it off and I was pretty happy with the result. I tried to over weather as spraying dullcoat tends to blow off the powders although I was hoping that the pan pastels would hold up better as they have a bit more "tooth" to them. Not only was that not the case, most of my powder blew off but the Army Painter Anti-Shine spray left a whole ton of white speckles all over the model. I'm not sure how to approach even fixing this at this point, but its to expensive a model to just discard. I think I'm going to go over it with just some pure mineral spirits and see what that does and I certainly won't be using that particular can of matte spray again. I have learned quite a bit with this project and hopefully I can apply all those lessons to the other Sherman that I have in progress. Also I need to remember to fix the powders in place first then apply the matte finish and the thing is I knew that and still didn't do it. Pretty happy with this point, although some of the paintwork on the tracks has been covered. I anticipating losing some of this powder when I seal it. I used three different pan pastels and one MiG pigment. I don't remember the colors right now but I have them still sitting on the table so I'll at least record them for the next time. And disaster strikes. While I lost a whole lot more weathering powder than I expect, I have also managed to add a ton of these white speckles. I have not idea how to fix this right now. I'll have to set it aside and think about it. This is the second in a series of four posts each concentrating on a different entry category. You can find information about the scoring system itself in the Painter Division post. From here forward I will just concentrate on how the component guidelines apply to the other three divisions. The Open Division is far more of a freeform division than the Painter Division. Here is where you get to really strut your stuff with major conversions and scratch sculpts. If you have just a single entry then the judges can just go ahead and score your entry, no discussion is necessary. If you have multiple entries, then there will be a discussion between the judges on which entry they want to score. That conversation is typically the only conversation although these discussions tend to be longer than they might be in the Painter Division. However, when selecting the scoring entry the conversation is still based on “I can score this one higher than the others” or words to that affect, till they come to a decision just as it would be for the Painter Division. If multiple entries are visually very thematic the judges may decide to judge them together as a single entry. What does this mean for the Open Division? In this division we are really want to see all your skills. While the components remain the same the emphasis has obviously changed a great deal. Difficulty: This is far more intuitive than it is in the Painter Division. The level of difficulty depends entirely on the difficulty of the conversion, with a minor conversion being the least difficult with graduations on up from there with a complete scratch sculpt being the most difficult. Creativity: Creativity stays about the same as it does for Painter. Painting is still a factor here. Now painting is combined with your ability to convert and sculpt to reach your audience. The entrant’s imagination comes into play here, you are looking for impact on the audience. Are you straining the boundaries of believability or are you trying to evoke a specific emotion from your viewers? Have you achieved what you set out to do at the end? Workmanship: This remains a pretty straightforward component but in the Open Division there is a higher emphasis on it. It reflects how well constructed the entire piece is. Any type of non-painting effort is represented here. Again a well done conversion means that the judge can’t tell that anything has been converted. A scratch sculpt should be properly proportioned and well sculpted (no thumb prints!). A missed mold line, poor assembly or a poorly executed conversion could easily drop you a while numeric value in the scoring. This is a category that we really encourage documentation, show us what you did and how you did it. Painting Skill: Everything that was said about painting still applies in the Open Division but there is less emphasis. At this point workmanship and painting are equal. While we don’t expect your abilities to be exactly equal in both areas you cannot count on your ability to paint alone to carry you over the top. Presentation: There is more emphasis on the is component as well. If you are building the entire entry, essentially from scratch then the presentation of your entry is going to have a significant impact on how a viewer perceives your entry. Bring your entry to life! Found some time to do a little more work on the Sledgehammer. I was trying to figure out how to remove some of the scratch marks left from removing the mold lines. I decided to try out the same stuff that I use on my metal miniatures; super fine steel wool. Worked like a charm! Here are a few components after the initial removal of mold lines. I have briefly toyed with replacing the barrel components with brass but I don't think I need to make that decision just yet. A better close up, looks pretty grim although most of that is not going to show through a primer coat I would prefer to start off with a better surface. After a few passes with the steel wool, which leaves quite a mess of small filings by the way. You can see the accumulated buildup of steel wool bits all over the place. I grabbed they had some excellent pictures of trenches actually under construction. A fascinating series for sure. While I have plenty on the British and American paratroopers in Market Garden this is the first book I have seen exclusively on the Polish paras. Followed by my second favorite German Armored Car series. And here is one to help me do some extra work on my Trenchworx Jagdpanther. As of late I have had a wild scheme working its way through my head which caused me to pull down all the books in my library on the PzKfw III (SdKfz 141). I was really looking for some drawings detailed enough to take measurements from and not finding what I wanted (and I have 11 books specifically on the Pz III but only two are really useful for drawings; Achtung Panzer #2 and the ancient Squadron Signal book). I have had my eye on the Panzer Tract books for sometime so I decided it was time to make some acquisitions. Turns out my timing is off, badly, and three of the five Panzer Tract books are out of print. Off I went on a swirl trying to find all five of them, which I did manage, although one of them is already commanding pretty high prices (although I don't think anyone is going to pay $700-$800 for these and there are a number for sale at those prices). I also managed to pick up a few others on a very dangerous trip to the Aberdeen Bookstore. I suggested that visit on Saturday saying that I was sure she would be able to find some books on Eisenhower there that she didn't have (I was correct and our bill for the day went up accordingly). I have three of the Panzer Tract books in hand now, with two still in the mail. One coming from Japan and the other from the UK, hopefully they will be here shortly. An example of the drawings available in a Panzer Tracts book. The originals are done in 1/24th scale and then shrunk down to 1/35th scale for the books. And this is the kind of thing that catches your eye while you are in the the bookstore. This one came with a set of decals, but they are a little different from what I'm used to. They may actually be some kind of peel and stick. Hopefully the book will have some information on them. This book is a real gem though, a whole section of color photographs from Pz IIIs in museums along with extensive scale drawings done in 1/48th scale. If you don't want to pay $100 for Panzer Tracts 3-3 (which covers the J, L & M variants) this would be an excellent alternative. And a small picture book, also with a set of decals. So that's five new additions to the PzKfw III library with two more on the way, which will bring the total to 17 or 18 I think. Another interesting fact is that the Sledgehammer BFG is based on the WWII Soviet B4 howitzer, also know as the Sledgehammer. And it was a towed, tracked howitzer (it could act as a self-propelled howitzer but could only manage about 9 MPH on a road). That gives me a reference to do a certain level of additional detailing if I so desire. So the gears were turning as I was cleaning up the parts the other day. The initial prep was just to remove the mold lines. With that chore done I need to go back and clean up the file marks and make sure I haven't flattened any cylindrical parts out. I'll do some filling of injection marks and dimples as well. I have been going over the pieces and noting where I could make detail changes relatively easily and see what detail I can pull over from the B4 howitzer. I think the concept for a diorama is starting to gel, it would be a good piece for that as I have no use for it as a gaming piece. Most of the Cannon portion plus the shells. More parts including the frame for the wheels. And the wheels! Six double wheels, three for each side. Pieces press fit together pretty nicely. the rear portion of the howitzer bed really begs for some extra detailing and the metal anti-skid plates could be replaced with some nice brass etchings. This will be a series of four posts each concentrating on a different entry category. These scoring “rules” are based on the MMSI painting competition in Chicago and variants of this system are used on an international basis. Michael Proctor and I took a good hard look at the rules a number of years ago and introduced a few tweaks to the system to better represent what we, as judges, are looking for when scoring your entry at Reaper Con. The basis for all of these is still the MMSI rules and there is not a whole lot of difference between the emphasis of the components in each division. One thing to keep in mind is that manufacturer awards do not necessarily use the MSP Open system. Those winners are, typically, chosen by the manufacturer (including Reaper for the Sophies) or their representative on site using their own criteria. The Reaper Con judging teams are made up of three judges (There are options to use 4 or 5 judges but regardless of how many judges are used only three scores are tallied). Each judge assigns one of these 5 values to each miniature assigned to their team. The three scores are tallied which gets a value somewhere between 0 and 12. That final tally gives a number that tells the team what award to give to the entrant for that entry. Judging is typically not done by committee, each judge assigns the score they feel the piece deserves and moves on to the next. Most discussion takes place around which piece to score when there are multiple entries. Judges do consult with each other when they have difficulty assigning a score to an entry. So that’s the basics, now let’s take a look at how a judge uses the five components to decide what score they are going to give you. The Painter Division is for stock models, those that come straight from the package or are assembled as shown by the manufacturer (it can include minor conversions). 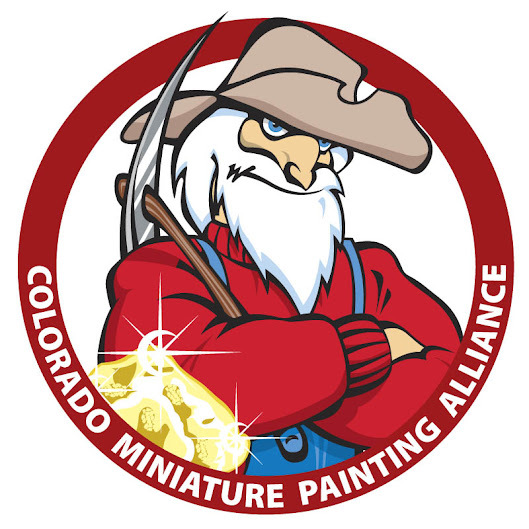 The Painter Division is the largest category at the MSP Open, often encompassing hundreds of entries at each show. There is no limit to the number of entries that an individual can enter in this category. I personally would limit yourself to your three best, but if you intend to be considered for other manufacturer or theme awards then it would not be out of place to see six or more entries from an individual. If you have just a single entry then the judges can just go ahead and score your entry, no discussion is necessary. If you have multiple entries, then there will be a discussion between the judges on which entry they want to score. That conversation is typically the only conversation that needs to occur for any given entrant. When selecting the scoring entry the conversation is based on “I can score this one higher than the others” or words to that affect, till they come to a decision which is usually pretty quickly done. If the entries are visually very thematic the judges may decide to judge them together as a single entry. So what does that really mean? In a nutshell we want to see how well you can paint! Did you really execute the different techniques to the best of your ability? Hence why painting skill is the predominant component that a judge is going to look at. Let’s look at a breakdown of those components and how they relate to a miniature in the Painters Division. Difficulty: This is definitely not an intuitive concept in the Painter Division. The judge is not looking at the techniques (including freehand) you used on the miniature. They are looking at how difficult is the miniature itself to paint. 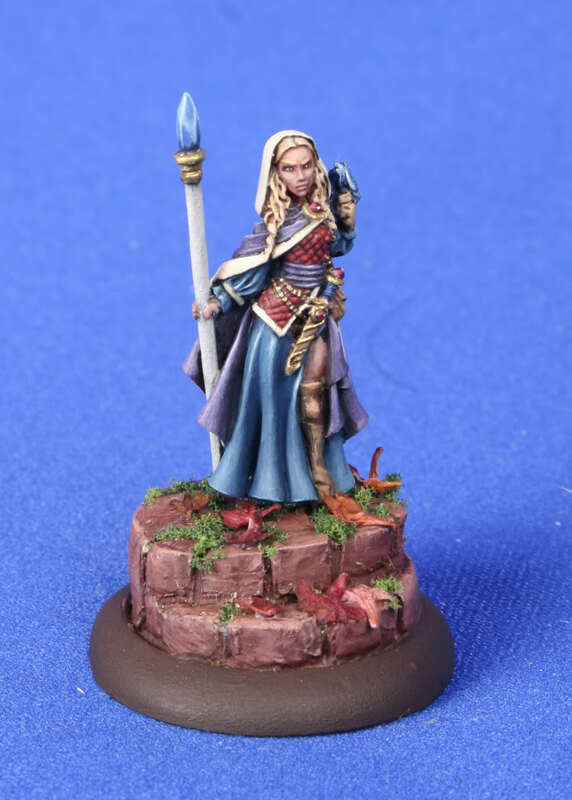 While how difficult a miniature is also subjective, subtle shading on flat or nearly flat surfaces are much more difficult to pull off than shading on a surface with more surface texture. Often difficulty is going to come into play when a judge is on the fence between two scores. Creativity: This component looks at use of color, color schemes and the use of freehand designs in other words things that aren’t part of the sculpt itself. 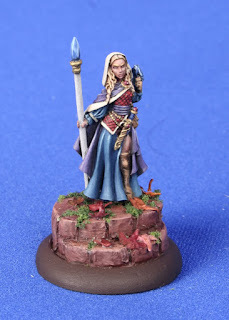 This is also where painted effects first come into play, like OSL (Object Source Lighting). This is the component that really addresses your freedom of expression on your entry and how well you bring that across to the audience. Workmanship: This is a pretty straightforward component. It reflects how well you prepared your model for painting. Any type of non-painting effort is represented here. In the Painter division this includes finding the elusive mold line and eliminating it but it also includes assembling a multi piece miniatures or executing minor conversions. A well done conversion or well assembled miniature means that the judge can’t tell that anything has been converted or that it had multiple pieces. A missed mold line, poor assembly or a poorly executed conversion could easily drop you a while numeric value in the scoring. Painting Skill: This is the whole key to the Painter Division entry, how well you apply paint to the miniature. These is where you are evaluated on the techniques you used how well you executed them. Tying everything together is really important as well. Everything you do must come together as a whole composition. It is an area where judges need to be aware of everything that is going on and how it is fitting together. While this is the predominate component of the Painter Division it is also the most subjective. Judges must overcome their prejudices about which techniques they prefer. As an example there is nothing wrong with drybrushing as long as you executed it properly regardless of how the judge feels about that technique. Here is an example of how a judge needs to be aware of many different styles and techniques. Blending doesn’t always have to be a smooth transition from light to dark, there are multiple different types of blending, it is how well you executed the technique or style you opted for. Do you blend like Jen Haley or like Alfonso “Banshee” Giraldes? They both achieve marvelous blends but their techniques are markedly different in achieving those blends. Presentation: While not the most important component in the Painter Division it is another example of getting the little things right. A nice, well executed base will set the “scene” for your miniature. It can be the simple base that the miniature came on or with or it can be more elaborate, although I would save the effort on a really elaborate base for a miniature going into the Open or Diorama divisions. This component is another that one that a judge will often use when making that final decision between scores, a tie breaker as it were. If you made it through that wall of text, congratulations! Hopefully that helped explain away some of the magic behind the scoring in the Painter Division. I count the package that arrived yesterday as more loot from Reaper Con since it really was a result of being at the show. Not much to show off and of course it includes a component for another wild idea that is not likely to get very far the Sledgehammer BFG. The extent of my miniature purchase. All I really ordered was the two Reaper Con Sophies for this year. The Kobolds were included for free, one pack for every $40 I think. I have no idea what I'm going to do with those. Some more paint, filling in some blanks in my color ranges, just to save time from mixing. The Sledgehammer BFG created in conjunction with Victoria Miniatures. A look at the crew. Apparently these are available from Victoria Lamb in resin. I'm contemplating getting that set along with some extra bits and pieces. She also produces three add on kits to the Sledgehammer, including replacing the wheels with tracks, adding a gun shield, or shortening the whole barrel up for more of an assault howitzer look.